Sunrisers Hyderabad beat Kings XI Punjab by 20 runs at Mohali. David Warner posted a brilliant half-century and the bowlers came up with a dream spell to demolish Punjab. The bowlers of Sunrisers Hyderabad that are considered to be the best of this season of Indian Premier League proved themselves yet again and produced a dream spell to restrict Kings XI Punjab to 130 for nine and helped Sunrisers Hyderabad hand them a 20-run defeat. Chasing a modest total of 151 to win, the Punjab batsmen couldn’t put up a brave face in front of some inspired bowling from Trent Boult. He was backed up by some cracking fielding from the Sunrisers Hyderabad. Earlier, the Sunrisers Hyderabad were put to bat first after Punjab’s skipper George Bailey won the toss and decided to bowl first. The opening duo of Sunrisers Hyderabad, the Warner-Dhawan pair has been consistent in this tournament so far but Shikhar Dhawan failed to build a partnership and was dismissed in the second over, caught at first slip by Murali Vijay off Mitchell Johnson’s spell. But the skipper David Warner blasted in the first five overs to move the total to 46/1. In the sixth over, Hanuman Vihari mistimes pull to Manan Vohra off Anureet at mid-wicket. By the end of 10 overs, even Warner was caught at long-on by David Miller on Axar Patel’s spell. 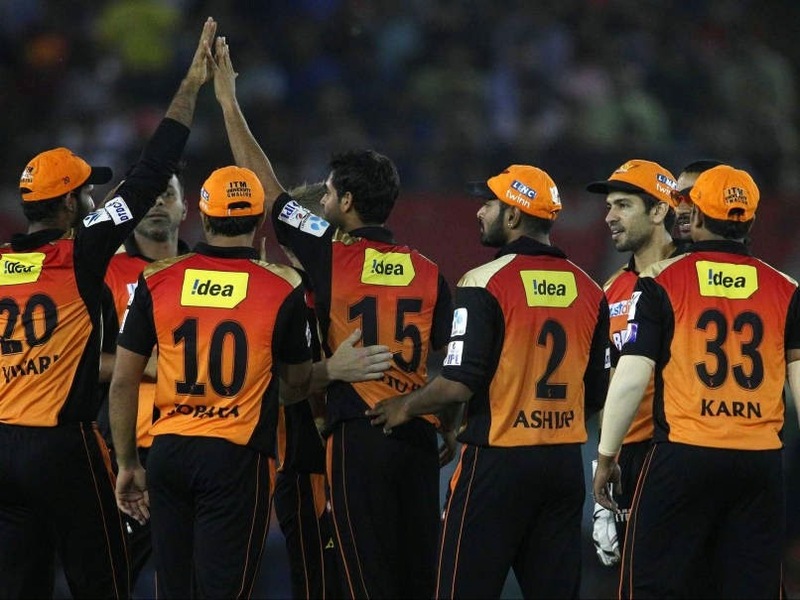 The Sunrisers Hyderabad were restricted to 150/6 with the help of contribution by Henriques’ 30, Naman Ojha’s 28 and Ashish Reddy’s 22 runs. Kings XI Punjab seemed confident enough to chase not-so-great total of 150 runs with players like George Bailey, David Miller and Shaun Marsh on their side. But Hyderabad didn’t put a foot wrong today as they managed to dish out a disciplined bowling performance to restrict Kings XI Punjab to 130 for nine. Punjab’s top-order batsmen didn’t get a start, the middle order managed to put on some runs on the score board but they crumbled badly. Wriddhiman Saha was the top-scorer with 33-ball- 42 for the Kings XI Punjab. George Bailey’s 22 off 16 was the second highest score. Punjab’s problems stemmed from the inability of their opening batsmen failing to put on some scores. The middle order struggled, but they were no good. It looks like dropping Sehwag and Maxwell wasn’t a wise idea for the Kings XI Punjab. From hero of last year to zero this year. Sunrisers defended 150 successfully. Kings XI started a bit too slow and lost early wickets. The Sunrisers bowlers chipped and broke partnerships. Kings XI, with that loss, continue to struggle at the bottom of the table. Trent Boult was entitled with the Man of the Match award for his brilliant 3-wickets haul. “It was quite a dry wicket , not much humidity. It was a good batting-wicket, we bowled really well. I am trying to come back and be as aggressive as I can. It’s nice to get a reward today and see the result. The first thing here is to get the length right and I’m enjoying my time here”, said the kiwi pacer Trent Boult in the after match presentation after receiving the Man of the Match award.